Dorothy a Publishing Project, 9780997366600, 128pp. Fiction. Translated from the French by Natasha Lehrer and Cecile Menon. "I believe there is a miracle in Wanda," wrote Marguerite Duras of the only film American actress Barbara Loden ever wrote and directed. "Usually, there is a distance between representation and text, subject and action. Here that distance is completely eradicated." It is perhaps this "miracle"--the seeming collapse of fiction and fact--that has made Wanda (1970) a subject of fascination for artists from Isabelle Huppert to Rachel Kushner to Kate Zambreno, and that set acclaimed French writer Nathalie Leger on an obsessive quest across continents, into archives, and through mining towns of Pennsylvania trying to get closer to the film and its maker. 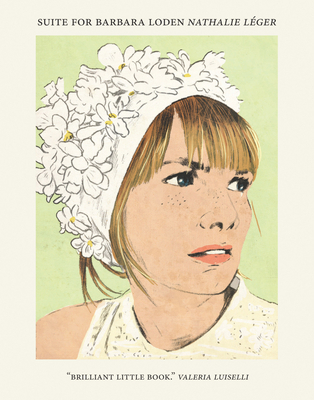 SUITE FOR BARBARA LODEN is the magnificent result. Moving contrapuntally between biography and auto-fiction, film criticism and anecdote, fact and speculation, SUITE FOR BARBARA LODEN is a stunning meditation on knowledge and self-knowledge, on the surfaces of life and art, and how we come to truth--a kind of truth--not through facts alone but through acts of the imagination.